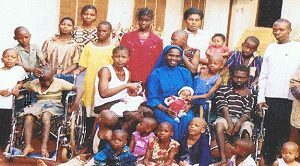 The Daughters of Divine Love Charity Home is a centre for street children and the less privileged founded by the Daughters of Divine Love in Nigeria. It started as a soup centre in 1986 where the sisters provide food once a day for street children, adults, people with mental health problems and poor indigent ones. It ran in this form for 10years until the sisters were able to provide the present structure and started taking in the children and others as residents for some organised programmes. Here they are given constant care hygienically, food, education, counselling and medical attention. We depend largely on charity for the maintenance of the centre and the inmates. Today the statistics of the centre is 50: (thirty two children and eighteen adults.) Others come in to eat and go since we do not have enough accommodation to take them in, but we visit them from time to time and take them in gradually as we rehabilitate some. We have since then through donations and help from people of good will, built an underground water tank for the centre. The children now have access to clean water and have roof over their heads. Some of the children are now in both secondary and primary schools with the help of some sponsors. Accommodation still remains a problem since the centre has only 8 rooms partitioned to accommodate the 50. This year the sisters have made effort to secure a proper site where it will be possible to provide these poor children with some basic facilities, as well as the possibility of a good school within reach. The estimated cost for this project is £180,000 (One hundred and eighty thousand Pound sterling). Our fundraising goal in England this year is to contribute to the building of this important home for the needy children. So we are appealing to people of good will to consider joining us in these misson of love and in our endeavour to make life better for these poor children in Africa by donating towards this project. If you would consider sponsoring a child please contact us on 02035615317 or on 07930479685 or email developmente@ymail.com.